Graham Lambkin (b. 1973) first entered the public consciousness in 1993 when he formed his band The Shadow Ring, in Folkestone, England. The band was memorable and built a rabidly passionate fan base because of its sui generis approach, blending elements of folk, noise, cracked electronics, and surrealist poetry, while radically changing the overall formula with each release. A decade of increasingly skewed and inspired work culminated in I’m Some Songs (2003), constructed long distance as Lambkin had relocated to the US in 1998. Over the last few years, Lambkin has primarily worked under his own name, releasing four solo LPs: Poem (For Voice & Tape) (2001), Salmon Run (2007), Softly Softly Copy Copy (2009), Amateur Doubles (2011), as well as two collaborative discs with experimental tape musician Jason Lescalleet: The Breadwinner (2008) and Air Supply (2010). In 2001, Lambkin founded the Kye label, releasing his own work as well as the work of other artists including Moniek Darge, Henning Christiansen, Vanessa Rossetto, and Call Back The Giants. Lambkin has also pursued a career in visual arts, designing packaging for musicians as diverse as Dead C, Double Leopards, Keith Fullerton Whitman, and Outer Space as well as merchandise for Midian Books, The Wire, W.F.M.U., et al. In 2009, Penultimate Press (London) initiated a series of hardback books documenting Lambkin’s visual and written work: Dumb Answer To Miracles (2009), Dripping Junk (2010), and most recently Millows (2012). Lambkin currently lives in Poughkeepsie, NY, with his wife Adris Hoyos and their two sons. C. Spencer Yeh was born in Taipei, Taiwan, studied film at Northwestern University in Chicago, IL, repped Cincinnati, OH, for many years, and is now based in Brooklyn, NY. He is recognized for his musical project Burning Star Core, as well as many other individual and collaborative activities with artists such as Tony Conrad, New Humans with Vito Acconci, Thurston Moore, Smegma, Prurient, and Jandek. Current projects include The New Monuments (with Ben Hall and Don Dietrich), a yet-to-be-named quartet with Nate Wooley, Ryan Sawyer, and Colin Stetson, and ongoing collaborations with Carlos Giffoni, Okkyung Lee, Justin Lieberman, John Wiese, Aaron Moore, Chris Corsano, and many others. Yeh has performed at events such as SONAR, Densités, All Tomorrow’s Parties, No Fun Fest, and Frieze Art Fair, and has also exhibited his visual and multimedia works at national and international venues including the Contemporary Arts Center in Cincinnati, the New Museum in New York City, White Flag Projects in St. Louis, International Film Festival Rotterdam, and alt.gallery in Newcastle. 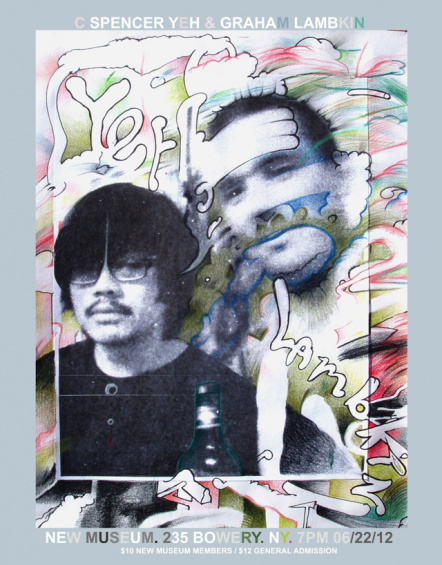 In the video medium, Yeh has worked with artists such as Hair Police, Deerhoof, Xiu Xiu, and LoVid. Recent and upcoming recordings include a solo CD 1975 on Intransitive Recordings, a quartet LP with Anla Courtis, Jon Wesseltoft, and Okkyung Lee on Feeding Tube, a quartet CD with Steve Swell, Paul Flaherty, and Weasel Walter, a duo LP with Robert Piotrowicz on Bocian, a quartet LP with Nate Wooley, Paul Lytton, and Okkyung Lee on PAN, and Transitions, his first full-length under the CS Yeh moniker, on DeStijl. Read an interview with Graham Lambkin and C. Spencer Yeh on the New Museum’s Tumblr.